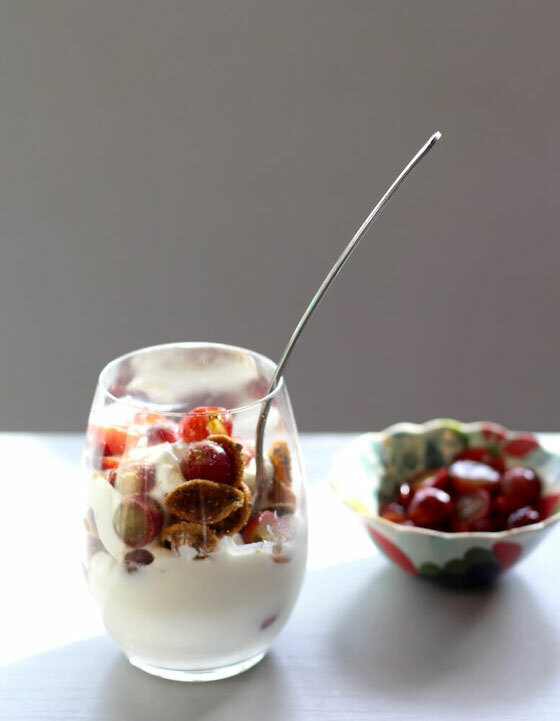 Dress up your breakfast with this Greek yogurt parfait! 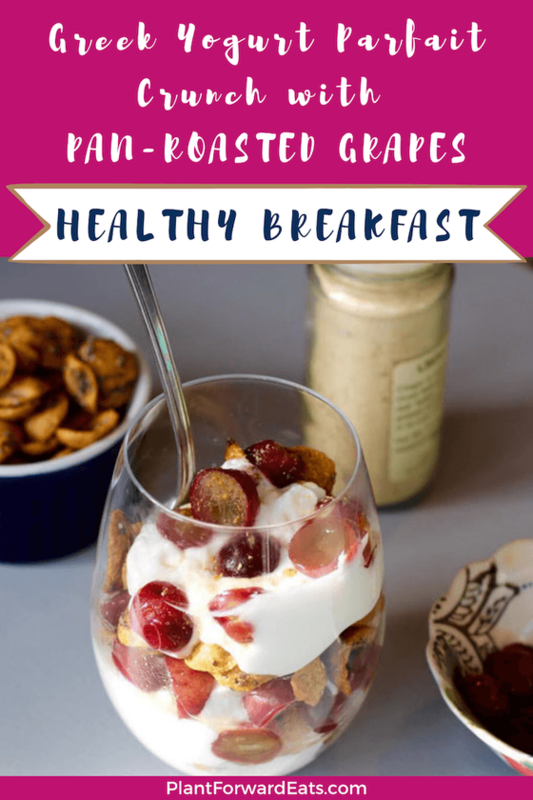 The cereal adds a delightful crunch, while the pan-roasted grapes add a satisfying juiciness. Greek yogurt is one of my breakfast staples, and I'm always looking for new, flavorful ways to eat it. While I was playing around in the kitchen this morning, I came up with the ultimate combo. First, I sliced and pan-roasted grapes. Heating brings out both their sweetness and natural juiciness. I mixed plain low-fat Greek yogurt with ground ginger. 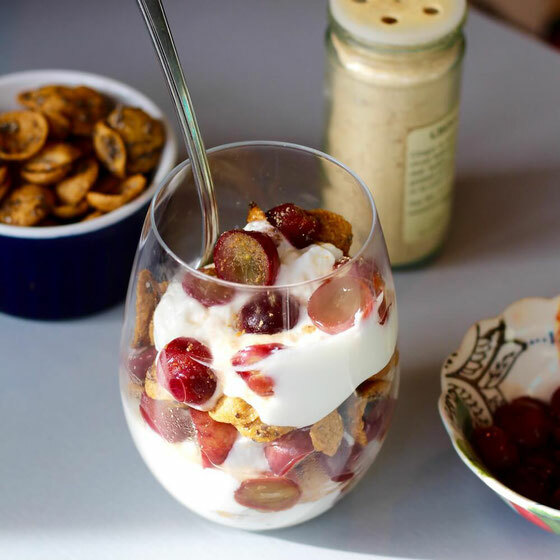 Then I layered the mixture with the pan-roasted grapes and whole-grain cereal. I topped off the concoction with a dash of ground ginger. Bonus if you find one with plant-based protein, such as chia seeds or almonds! These additions may increase the protein content of the cereal. This recipe takes less than 10 minutes to make and is great for both busy and leisurely mornings. Serve it in a clear glass to make it even more visually appealing! Looking for other ways to enjoy the flavor of grapes? Try my grape vinaigrette salad dressing and my Brussels Sprouts with Grape Honey Glaze. Coat a medium pan with cooking spray; pan roast halved grapes over medium heat until slightly browned, about 2-3 minutes. Stir frequently. Meanwhile, combine all but a dash of the ginger with the yogurt. 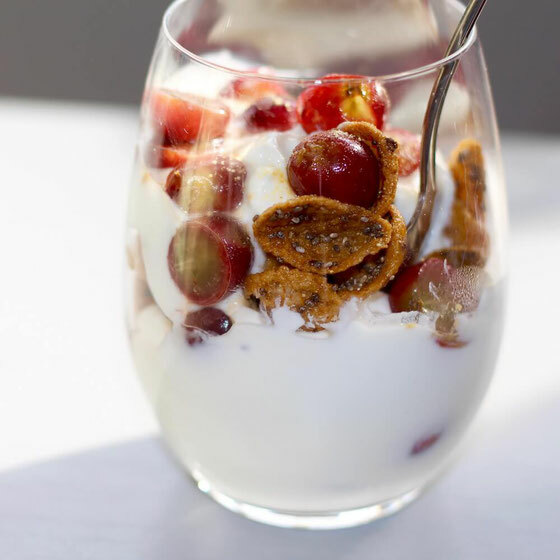 In a clear glass, layer yogurt with fruit and cereal. Top with a dash of ginger. Serves 1. * I used Nature's Path Qi'a Honey Chia Superflakes. What are your thoughts on this topic? What's your go-to healthy breakfast?